Pick a ready-made template. We offer a vast choice of professional templates: they are sorted by category to help you pick the right one for you, and they already contain both the CAN-SPAM act compliance tags and an unsubscribe link. All templates are created by expert designers to ensure the best rendering on any clients and webmails. Upload an existing template. If you already have your own layout, you can upload it in seconds: both HTML (.html and .htm) and zipped (.zip) files are accepted. If you want to upload a .zip file, just make it sure that it contains your HTML one (please name it “index.html”, “index.htm” or “campaign.html”) and all the images contained in your template. Also remember that your HTML template must contains the images as well: it’s a common mistake to forget them if they’re associated with external files on your desktop. Use our Template Creator. If you want to design your own HTML layout but don’t know how to code, no worries. 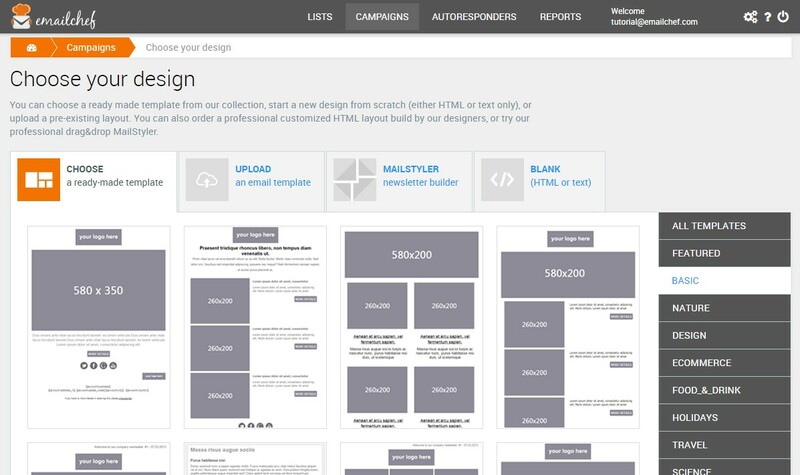 Download our powerful Template Creator, a drag-and-drop newsletter building software that will allow you to compose amazing layouts in a breeze. Start from scratch or code in HTML. Of course you can build a newsletter from scratch either in our visual editor or writing your own code. Anything you’ve chosen, it’s time to customize it.